Sam Korman from Team TrotBot put his Python skills to work to improve our simulators, and shares his code below. For those who are not that experienced with Python, Sam included many useful comments in his code. ​​First, here's Sam's simplest script that animates TrotBot in place. Finally, here's the python code for simulating Klann's Mechanical Spider (updated on 12-20-2018), which makes it easier to switch from Klann's patented linkage configuration to the LEGO approximation of Klann Ver 2. ​​​In the below video of the LEGO approximation, Klann was animated in place by setting the "moving" variable to "False". Also, you can find the joint and bar maps used in the simulator here, which the python script now matches. 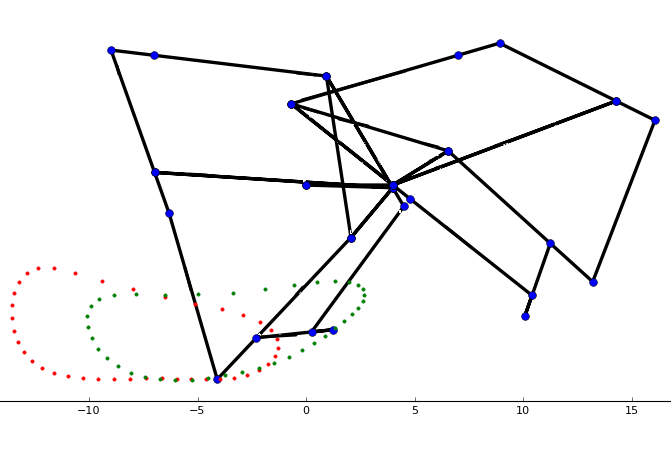 The algorithms, and how we used them to simulate linkages, are described here.